It’s quite fitting to have Ms. Parks as the spotlight on this day since – today is her birthday. Rosa Louise McCauley Parks (February 4, 1913 – October 24, 2005) was an African American civil rights activist, whom the U.S. Congress later called “the first lady of civil rights”, and “the mother of the freedom movement”. On December 1, 1955 in Montgomery, Alabama, Parks, age 42, refused to obey bus driver James Blake’s order that she give up her seat to make room for a white passenger – Parks’ action sparked the Montgomery Bus Boycott. At the time of her action, Parks was secretary of the Montgomery chapter of the National Association for the Advancement of Colored People (NAACP) and had recently attended the Highlander Folk School, a Tennessee center for workers’ rights and racial equality. Nonetheless, she took her action as a private citizen “tired of giving in”. Although widely honored in later years for her action, she suffered for it, losing her job as a seamstress in a local department store. Eventually, she moved to Detroit, Michigan, where she found similar work. From 1965 to 1988 she served as secretary and receptionist to African-American U.S. Representative John Conyers. 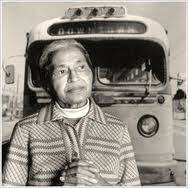 After retirement from this position, she wrote an autobiography and lived a largely private life in Detroit. Side note: Check out the other post we wrote on Ms. Parks back when the Google Doodle acknowledged her.